UNESCO had added three 19th-century goldfields diaries from the State Library of Victoria collection to the Australian memory of the world register. Combined the diaries provide first-hand accounts of some of the most significant moments of the Victorian gold rush, from the discovery gold to the Eureka rebellion. Joanne Ritale, Collection Services Manager at the State Library of Victoria, who attended the announcement in Adelaide last night, was delighted with the diaries’ inclusion. ‘These diaries add significantly to our understanding of life on the Victorian goldfields and the everyday concerns of people there at that time. They are an important part of Australia’s collective memory. The diaries now add to the other significant State Library collections on the Australian memory of the world register: the Port Phillip Association Records and the Minute Books of Pre-Federation Australian Trade Unions. The Life and Adventures of Edward Snell from 1849 to 1859 by Edward Snell. 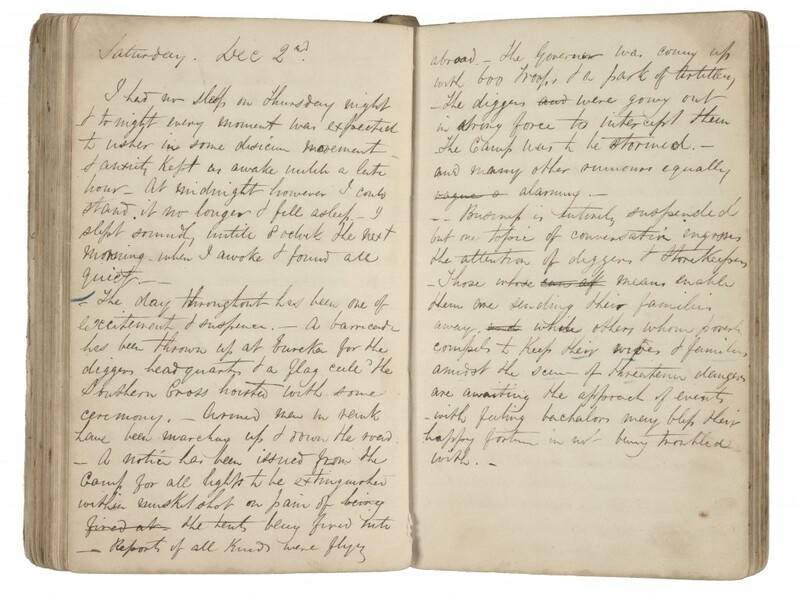 Edward Snell’s diary records his firsthand experience during two important historical moments in Victoria – the gold rush and the railway boom. Snell was an engineer, surveyor, artist, adventurer, and a diarist. This diary, documents his experiences in South Australia, Tasmania and Victoria – where, after spending several months on the Bendigo goldfields, he won the contract to build the Geelong to Melbourne Railway, Australia’s first country railway. View images from the diary and further information about Edward Snell. Diary of Charles Evans, 1853 September 24 -1855 January 21 (formerly known as the Lazarus Diary) by Charles Evans. Contains one of the few eyewitness accounts of the Eureka uprising at Ballarat, Victoria in December 1854, in which at least 20 miners died. Entries span 16 months, from 24 September 1853 to 21 January 1855. They recount many of the key events associated with the uprising, from the burning of the Eureka Hotel to the bloody aftermath of the storming of the stockade. View the full diary online. Diary of a miner working on the Ballarat goldfields, 1855 Jul. 8 – 1856 Jan. 1, author unknown. The diary describes the daily life of a miner at Ballarat and surrounding goldfields, with a record of income and outlays for July-Dec 1855 at the back of the volume. It contains descriptions of the weather conditions, chores, meals, and many local events including visits to theatrical performances by Lola Montez, Charles Thatcher and others, deaths and near fatalities by fire and in mining accidents, the murder of a butcher, the escape of a Bengal tiger from the Montezuma Circus into Ballarat’s main street, and trips to Melbourne to visit the Botanical Gardens and to witness construction of a bridge across the Yarra River at Richmond Point. The identity of the writer has not been established but he appears to have been a Scotsman, probably from Glasgow or nearby Dumbarton. Founded in 2000, the UNECSO Australian memory of the world register was the first in the world; now there are more than 60 national Memory of the World programs, and is designed to list documents that have significant documentary heritage.